A few years ago I found myself at Bestival. And in-between the fancy dress, champagne cocktails, sleeping in a beach hut with a proper bed (I was glamping, you might be sure), I could be found staking out a particular Caribbean food stall, the name of which my mind lost in the Hidden Disco on the last night. I went back time and time again that weekend because the food tasted as vibrant and colourful as it looked, and because, quite simply, I fell in love with their coriander salsa. I poured it over everything they sold, that slinky green pesto like sauce, vowing to master it when I got home and douse everything from cheese on toast to Jamaican pasties with it. It turned out it wasn’t as easy as I’d thought. The owner of the stall had told me what was in it, but it just didn’t taste the same, and I couldn’t for the life of me get the recipe right, so I parked it as nothing more than a fond food memory. Until this weekend. I had a huge bunch of coriander in the fridge that I knew wouldn’t last another day, and into my head popped that salsa. I approached it like a brand new dish I was creating, rather than recreating, and put the herb into my Magi with a clove of garlic, olive oil, lemon juice, sea salt and pepper, and (here’s the thing I’d not tried before) toasted cashew nuts. Blitzing to a smooth pesto-like consistency. Now, Bestival was some years ago, so I can’t say with absolute certainty that this sauce is exactly the same, but I do know that I squealed, ummm’d and aahhh’d quite a lot on eating it, just as I did that summer on the Isle of Wight. And the large jar of it that was made yesterday morning has been severely depleted. If you like coriander, and mixing up world flavours as I do, you’ll find loads of uses for it from dressing lamb burgers to drizzling over whole BBQ’d fish. And here in this recipe I’ve used it on top of chicken cigarillos — filo pastry wrapped chicken. These are really easy to make, are a little bit different and are packed full of flavour. The chopped chicken thighs (thighs for taste, juiciness and thriftiness) are marinaded in rum, lime and smoked paprika, and the whole lot is cooked and mixed with chopped cooked peppers, before being rolled up nice and tightly inside filo pastry sheets. Baked, they make a great meal for sharing with friends and family, served with your favourite salad and drizzled (liberally) with the coriander salsa. Time to put a large bunch of the green stuff and some cashews on this weeks shopping list. Start with the salsa — place the garlic and cashews into a food processor and blitz, then add all the other ingredients and blitz until smooth, but don’t over blitz. The sauce should be like a loose pesto. Test the seasoning for taste and add more salt if needed, then decant into a jar or airtight container until you need it. For the chicken, mince either in a food processor or by hand as smooth or as chunky as you like, and in a large mixing bowl add a scrunch of salt and grind of black pepper, the garlic, ginger, 1 tsp smoked paprika, rum and the lime juice. Stir to combine and place in the fridge to marinade for at least 30 minutes and up to 1 day. When you’re ready to cook the chicken, fry the diced peppers and onions in a little oil for around 5 minutes to soften a little, add the lemon juice and set aside. Wipe out the pan and heat with a little more oil, adding the chicken and rum mixture. Fry on a high heat continually stirring, cooking the chicken through and separating it. Remove from the heat and when cooled a little, add the pepper and onion mixture, stirring to combine. Leave to cool. When you’re ready to assemble (and the filo have been brought up to room temp for an hour in their packet) preheat your oven to 200°C, and melt the butter on a low heat ready to use. As per the pictures, take each sheet and spoon out some of the chicken mixture at the edge closest to you, brush the edges of the sheet with melted butter, fold the sides in slightly, and tuck and roll the chicken inside the filo, rolling over and over until you get to the end — making sure there’s enough melted butter along this back edge to stick the filo securely. Repeat until you’ve used all the chicken mixture. Lay the chicken cigarellos onto a lightly greased baking sheet/baking paper on a baking sheet, seam side down, and brush with more melted butter. Bake for around 12 minutes. 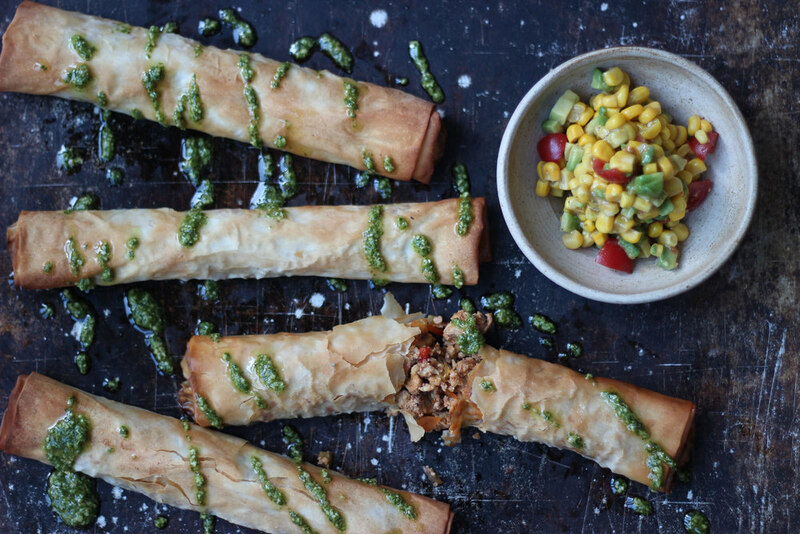 Remove and plate up, drizzling the coriander salsa over the cigarellos, and serving with your favourite salad — I used smoked corn and avocado.